This year, Morning Star supporters gave out a record 2,200 free copies of the paper. These were paid for by Unison SW, Unite, the Prison Officers’ Association and the RMT. On the Saturday, a meeting was held on “What revolution in Russia meant for British workers”. This was chaired by Ben Chacko and Liz Payne spoke from the platform in her capacity as Chair of the Party. 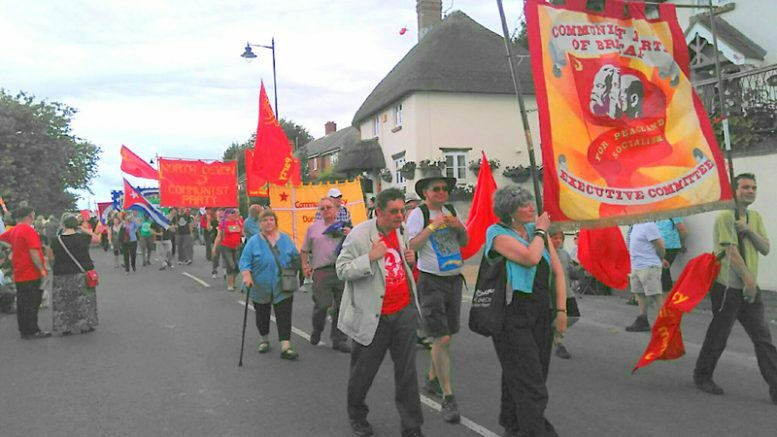 This was the first time that a CPB member has spoken at Tolpuddle officially representing the Party. David Pettifor (who now staffs the party’s head office) came down to staff the party stall, selling about £150 worth of party materials, and a special edition of Unity! Was given out. Badges were very popular as was the Our History Tolpuddle Martyrs edition. BLOCK! (the main congress resolution) also sold well, David said. The festival itself was, once again, a great success, with record attendance and with Jeremy Corbyn speaking for the first time as Labour leader. Two of our comrades are involved in the Cornwall TUC which has been re-established after a break of 15 years! The Bristol, Bath & Gloucester Morning Star Readers’ and Supporters’ Group raised an excellent £650 at their sun-drenched garden party and Mendips walk on 6 August. Somerset CPB Branch had a little garden party and raised £300. Bristol, Bath & Gloucester branch has a public meeting on “Reform and Revolution” on Wednesday September 13th. The speaker, Graham Stevenson, has a long history in the Communist and Trade Union Movement and, combining theory with practice, won 5,696 votes in the recent West Midlands mayoral election. He is therefore ideally placed to speak on the topic of the relationship between reform and revolution from a historic as well as a contemporary perspective. The meeting starts at 7.30pm and is at the YHA, Narrow Quay, Bristol BS1 4QA. I went to South Africa in July to attend the national congress of the South African Communist Party and to receive the SACP’s Special Recognition Award on behalf of all the “London Recruits” (who include myself and comrade Bevis Miller). See the website www.londonrecruits.org.uk where you can read my acceptance speech or watch it on video, with the introduction by Ronnie Kasrils and the presentation. The DC has no more meetings scheduled until our District Congress on 19 November. The Committee will do its work by email. At its last meeting, the DC decided to urge all branches to organise an event to celebrate the centenary of the Russian Revolution, even if it is only a branch gathering or an invitation meeting. A welcome change is taking place in British politics, vindicating our Party’s analysis and strategy. The situation is full of opportunities – let us seize them! Be the first to comment on "South West District Newsletter 5 – 2017"